This delicious and healthy banana is quick to whip up and makes an amazing breakfast or snack! This is a fantastic, high fiber recipe that's perfect for fall! 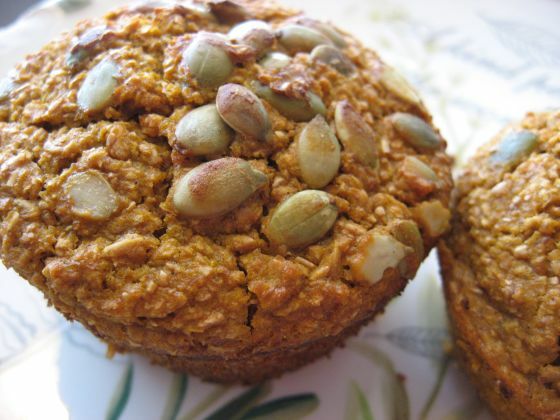 Oat fiber is good for the heart, and pumpkin is full of antioxidants! See the entire recipe and directions at The Genius Kitchen. This recipe makes a delicious, hearty breakfast or snack that compliments both sweet and savory flavors. Note: I rarely have milk in my house, so while all baked goods recipes are better with milk (or non-dairy milk), apple juice or even water is completely acceptable, it just won't be as perfect as when made with milk. This recipe is not very sweet, if you would like a sweeter muffin, increase to a full tablespoon of stevia powder. See the entire recipe and directions at Sugar Free Mom. One frequent problem with gluten free baking is that gluten free breads don't usually rise as much as conventional wheat baked goods; these rolls are an exception- and they're exceptional! See the entire recipe and directions at Lynn's Kitchen Adventures. These are fantastic! They have such a light, fluffy texture- my daughter absolutely loves them! If you don't have a great blender, these may work better in a food processor (though I was able to make them in my cheap blender, I just needed to stop the blender and stir the ingredients several times). Read the entire recipe and directions at Miss Recipe! This is a unique, flourless muffin recipe that is suitable for low sugar and low carb diets. For the complete recipe and directions go to Satisfying Eats. My daughter loves these, and seems to think they're a treat for breakfast, when in fact they're reasonably healthy. This same recipe can be used for muffins or a loaf. 1. Preheat oven to 375 degrees F (175 degrees C). 2. In a large bowl, combine flour, baking soda, cinnamon, and salt. In a separate bowl, combine pumpkin, oil, mashed bananas, eggs, vanilla extract and sugar until well blended. Stir pumpkin mixture into flour mixture; stir just to moisten. Drop by scoops onto a cookie sheet. 3. Bake in preheated oven for 20 minutes, or until the bottoms are lightly browned. This bread is literally health on a plate. It’s more dense than most breads, but it’s wonderfully filling and makes a fantastic breakfast or snack.